This is written in response to someone named Tim Rush, who is the most vocal, active and visible opponent to a Chivas USA move here. His letter to the OC Register is available here. 1. First you suggest that a stadium for Chivas USA would be better in LA because there are more Latinos there, compared to Santa Ana and Anaheim combined. But what about the rest of OC’s Latino populations? Or those in cities near the LA / OC border. Do you think they won’t come to watch a game in Santa Ana? Are all Angel fans from Orange County? 2. To say that a stadium in Santa Ana would be “Orange County’s version of the LA Coliseum” is a gross and devious exaggeration. I want you, Tim Rush, to tell me how many soccer stadiums in Major League Soccer are the size of the coliseum. 3. You left out Harbor Boulevard and conveniently chose to use Fairview and Bristol as examples. For those coming from LA county, exiting off of the 22 to Harbor will get them to the proposed site in 5 minutes. I know because I drove that route specifically to find out how long it would take. 4. Your writing suggests that all expenses are passed onto the city. Look at all of the sponsors that Chivas USA has. 5. Most devious of your comments is your hinting at potential violence happening here through your example of what happened at Dodger stadium. This is a deliberate and devious scare tactic. 6. I almost believe that you are well-intentioned and that you wouldn’t mind having a stadium off of the 55 (where exactly? ), but still, you hint at violence as if it were inevitable and you turned this into a race issue by saying that there are more Latinos in LA so a new Chivas USA stadium should go there. You’ve exaggerated in your comments thus poking holes in your own argument. 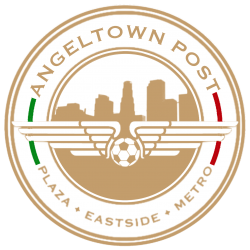 Here’s a new blog for discussing soccer matters in Santa Ana. As some may or not know, Santa Ana is a soccer town. A number of international clubs, mostly Mexican, have come to scout and develop talent here over the years, but the most visible club to have interacted with the city is Chivas USA. 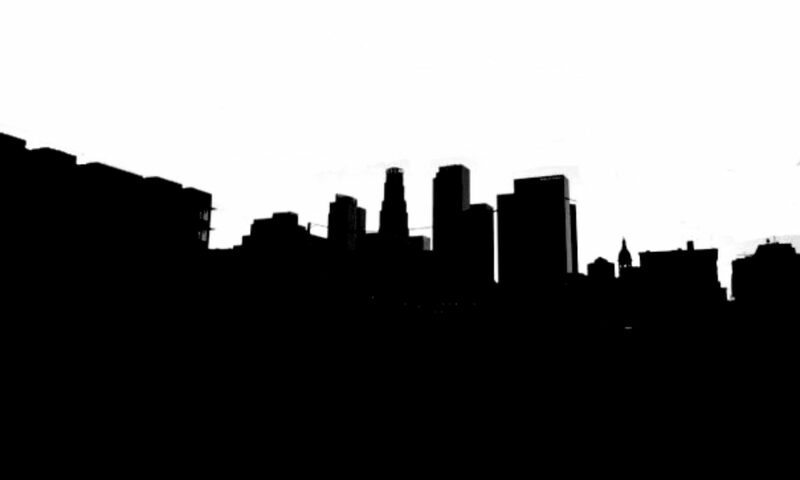 They currently are weighing their options around Greater Los Angeles and Santa Ana is on their radar. No, this isn’t about Chivas USA moving to Santa Ana. Instead, their sister club Chivas de Guadalajara of Mexico, will send their U-20 (under 20 years of age) team to Santa Ana for a friendly match against the Santa Ana Winds of the National Premier Soccer League on December 10th at Eddie West Field in Downtown Santa Ana at 7 pm. 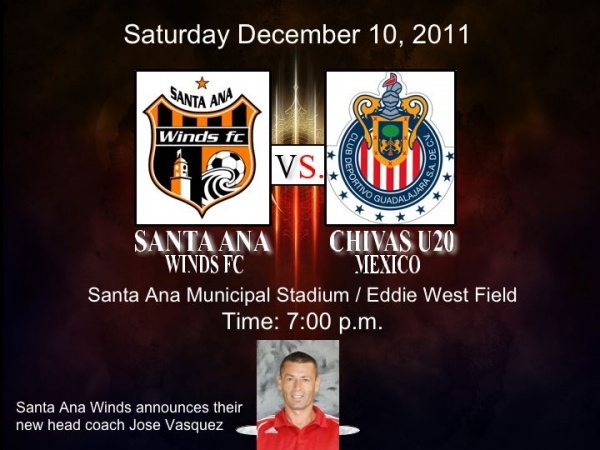 Leonel López, a writer for the Santa Ana Winds Football (soccer) Club reports that Santa Ana College soccer coach José Vásquez will coach the Winds for their 2012 season in the National Premier Soccer League. The NPSL is experiencing growth nationwide for a consecutive year. The Winds will be joined by the incoming Fullerton Rangers club that is known for their youth academy. Vásquez led the SAC Dons to eighteen consecutive Orange Empire Conference league titles as an assistant and head coach. SAC is one of the most reputable teams in the state and nation and enters the playoffs against Rio Hondo College on Saturday, November 19 in an away match. For more on this story see Santa Ana Winds FC. DOWNTOWN. Santa Ana Winds FC of the National Premier Soccer League (NPSL) came close to qualifying for the US Open Cup, the oldest soccer tournament in the United States that involves the top leagues in the country including Major League Soccer (MLS), United Soccer Leagues (USL PRO), the North American Soccer League (NASL) and the NPSL. The NPSL is a robust league comprised of six divisions competing nationwide, for a total of thirty seven teams. The Santa Ana Winds compete in the West / Flight Southwest division with the San Diego Flash, San Diego Boca FC, Rattlers FC of Lancaster and FC Hasental of the San Fernando Valley. The club is also paired up with the West / Flight Northwest divisions teams of Hollywood United, Sonoma County Sol, Bay Area Ambassadors and Real San José. The NPSL was allowed four teams with the best record after seven games to qualify for the US Open Cup, which is run by the United States Soccer Federation. The best team in each NPSL division earns a berth. Santa Ana came very close to qualifying, they lost their opening game against the eventual qualifying team Hollywood United 1-0 at Centennial Park in Santa Ana. That first game made all of the difference and tipped the division in Hollywood’s favor. Hollywood (7, 1, 0) and Santa Ana (5, 0, 1) are currently the top two teams in the West, both are offensive powerhouses though Hollywood has been pummeling the competition with the exception of Santa Ana. Click here for team info and the rest of the western standings. The Santa Ana Winds next play Real San Jose on Saturday, May 21 at Santa Ana Stadium at 12:00 pm. The Chivas USA and LA Galaxy youth academies square off later on that day at 5 pm Santa Ana Stadium. A new addition to the NPSL, the club was founded in 2009 and has played locally the past few years. This is the club’s first campaign to qualify for the US Open Cup. The NPSL is sanctioned by the United States Adult Soccer Association (USASA) as an affiliate of the United States Soccer Federation (USSF), the ruling body for soccer in the United States and FIFA the world’s ruling body for soccer. The NPSL operates and is managed as a team run league. The structure of the league will allow each participating team to have one vote on the executive committee. Each team is owned and operated individually, and is responsible for maintaining league minimum standards and for raising its own operating cash. The existing team owners, that comprise the league management team, approve all new teams who desire to join the league. Santa Ana, CA–May 21, 2011–Winds FC is victorious once again with a sixth straight win on a very hot and sunny day in Downtown Santa Ana. Real San Jose FC arrived at Eddie West Field at Santa Ana Stadium with one thing in mind and that was to drive back with a win. Real San Jose took the field with a very aggressive formation but the tempo of the match was established by Santa Ana. The Winds charged numerous times with strikers forcing San Jose defenders to work extra hard to clear the ball. Mike Piechota broke the defense with a perfectly assisted ball to his twin brother Greg Piechota taking on the Real San Jose’s goalkeeper doing his best to stop a powerful ground shot on the 7th minute to unlock the score in favor of Santa Ana. Soon after the goal the Winds felt the heat of the sun this being their first time playing a match at 12:00 noon. The visitors from the North took advantage of this gap in the Winds concentration to finally create some ball movement of their own and with a nicely fed ball to San Jose striker George Mayer taking on Winds goalkeeper Juan Rodriguez that stood up to the challenge deflecting a laser ground shot with his leg to send the ball for a corner kick. Coach Raul Ruiz said, “Our team took the field very determined to take the win but the heat was truly a factor this being the first time our team was exposed to the elements. The players took the foot off the pedal giving San Jose the advantage for a few minutes.” The second half saw some changes for both teams. One of them was on Santa Ana’s goal sending Tony Flores to guard the Winds’s lead. With the addition of midfielder Carlos Godinez, the Winds seemed to have more depth and ball movement. The 62nd minute finally saw the score move again with a perfect ball assisted by Carlos godinez to Adan Coronado on the left flank who put the Winds ahead 2-0 with a powerful left-footed shot. Santa Ana Winds FC travels for the first time this season to the Bay area to pay a visit to the Bay Area Ambassadors on Saturday, May 28th.